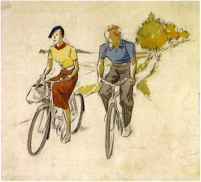 Ernst Dryden, Cycling couple, 1930. Courtesy Mary Evans Picture Library/Dryden Collection. Cycling and hiking were among the sporting activities popular at this time - an open-necked, short-sleeved shirt is teamed with baggy flannels, while a tweed skirt is worn with a short-sleeved top, bandana and beret. In 1925 the Exposition Internationale des Arts Décoratifs, from which the term 'Art Deco' derived, was held in Paris. Notoriously difficult to define, Art Deco initially drew on many of the new artistic 'isms' of the prewar years, went on to encompass the emerging influence of the German Modernists, typified by the work of the Bauhaus designers, and ended in a celebration of sleek, streamlined machine-age Modernism. At the Exposition, Paul Poiret moored three barges on the Seine in which to display his collection, but by now his lavish, exotic creations were increasingly at variance with the modern aesthetic. The Gazette du bon ton noted that they were 'the product of a man who revels in the unexpected, producing designs that few people can wear'. Financial difficulties soon beset him; the house closed in 1929, and he was to die forgotten and impoverished. Chanel maintained her position at the forefront of Parisian couture, launching in 1926 her seminal 'little black dress', described by American Vogue as 'The Chanel Ford - the froclc that all the world will wear'. Perfectly in tune with the times, she continued to make easy-to-wear day clothes for the woman who desired understated luxury and pared-down simplicity. Sportswear became an essential element of fashion. Jean Patou, whose boutique Au Coin du Sport was the first of its kind, numbered among his clients the ultrachic tennis player Suzanne Lenglen, who, wearing her trademark bandeau and Patou's practical knee-length, pleated, drop-waisted dresses and knitted sweaters, set a new standard of elegance on the court. Sporty yachting trousers with blazers were worn for sailing; skiwear was improved by the use of zip fasteners and newly developed elasticated fabrics, while swimwear, increasingly brief, also benefited from advances in textile technology. Other established Parisian designers such as Lucien Lelong, Jane Regny and Jeanne Lanvin also catered for this market and were soon joined by the Italian Eisa Schiaparelli. Schiaparelli was Chanel's great rival. Her dazzling career began when her first design, a close-fitting black sweater with a white trompe l'oeil bow, was spotted by an American buyer. In 1927 she opened a boutique in Paris called Pour Le Sport, which sold sweaters and sportswear in novel designs. Schiaparelli was closely associated with many artists of her time, including Salvador Dali, Jean Cocteau and Christian Bérard, all of whom produced designs for her. Greatly influenced by Surrealism, she translated mundane objects into high fashion: lollipop buttons, padlock belt-buckles, balloon-shaped handbags, lamb-chop-shaped hats and suits that resembled chests of drawers. By the thirties Schiaparelli was phenomenally successful. Her philosophy that 'clothes should be architectural; that the body must never be forgotten and it must be used as a frame is used in building' was evident in her shapely waisted suits with squared, padded shoulders that realigned the fashionable silhouette. 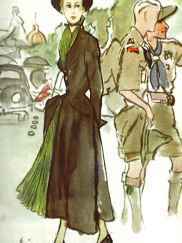 Christian Bérard, Original illustration for cover of Vogue, 1938. Watercolour and gouache. Courtesy Galerie Bartsch & Chariau, Munich. The bohemian Christian (Bébé) Bérard, an artist and designer associated with Cocteau, for whom he designed La Belle et la bête, was poached from Harper's Bazaar by Condé Nast in 1935. 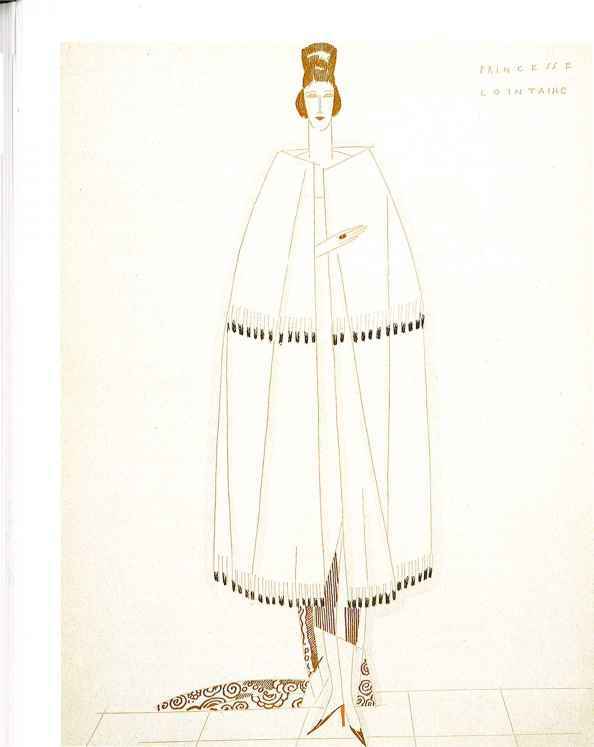 Another couturier whose designs are often compared to architecture was Madeleine Vionnet, the technically brilliant inventor of the bias cut, that sleek, graceful, though unforgiving, style that replaced the figure-concealing tubular dresses of the early twenties. Femininity became fashionable once more - the hemline dropped and there was new emphasis on the waist, now at its natural level, and on the hips and shoulders. Menswear echoed the shapely feminine silhouette: suits were cut with broader shoulders, wider lapels, nipped-in waists and draped trousers with turn-ups. American styling became increasing prevalent, with the US menswear clothing industry specializing in sporty, casual clothing and resortwear. With the increased opportunities for tourism that arrived with air travel, holiday clothing for men was transformed by casual slacks, short-sleeved shirts and streamlined swimwear. 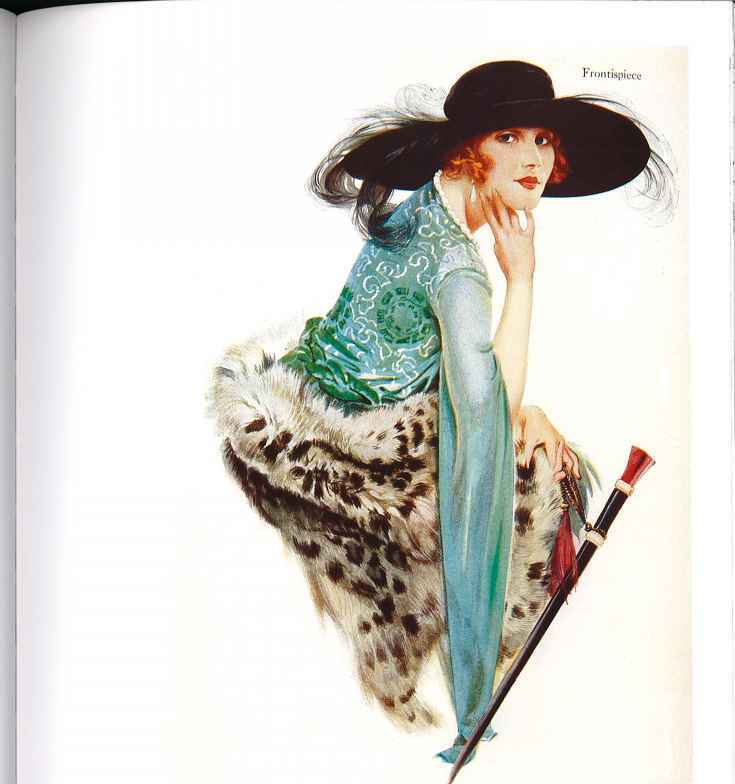 As has often been said, the twenties and thirties represent the 'golden age' of fashion illustration. Condé Nast's admiration for Vogel's Gazette du bon ton encouraged him to invest heavily in illustration within the pages of Vogue. And from 1910 until the outbreak of the Second World War, its cover - always of greatest impact and importance - featured an illustration by one of his team. Vogue's early illustrators - Helen Dryden, George Wolf Plank, Georges Lepape and J. C. Leyendecker - were joined after the First World War by an influx of Europeans, including Eduardo Benito, Charles Martin, Pierre Brissaud, André Marty and Mario Simon. However, Vogue's prime objective - often expressed by Nast and his indomitable editor-in-chief, Edna Woolman Chase - was to show fashion to their readers in as much informative detail as possible. Here Nast and Chase found themselves at variance with their illustrators, and complained that 'the artists were chiefly interested in achieving amusing drawings and decorative effects ...they were bored to death by anything resembling an obligation to report the spirit of contemporary fashion faithfully'. Anonymous, Advertisement for Dolcis shoes, 1940s. Courtesy Museum of Costume, Bath. 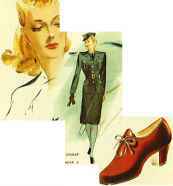 Advertising campaigns during the war concentrated on highlighting the potential glamour of uniform. lay in photography, and illustration was mainly relegated to the inside pages. On both sides of the Atlantic, Parisian couture continued to dominate, led by Chanel, Schiaparelli and Vionnet. But the economic recession that followed the Wall Street Crash of 1929, as well as disputes among French garment workers in the 1930s, began to undermine Paris's hegemony. The US fashion industry, though still paying homage to the French capital, was growing less dependent on it. American garment manufacturers made such great strides during the interwar years, improving large-scale production methods and standardizing sizing, that the US domestic ready-to-wear industry began to outstrip that of any European country. Increasingly, American designers were promoted by major department stores such as Lord & Taylor and Bergdorf Goodman. Hattie Carnegie's smart, tailored suits and Claire McCardell's casual styles, epitomizing the easy-to-wear American look in utilitarian fabrics such as denim, found a new customer base. Wallis Simpson's choice of a gown by the American designer Mainbocher for her wedding to the abdicated Edward VIII further boosted the domestic market. Hollywood also emerged as an arbiter of style: glamorous stars of the screen, male and female, became fashion icons. Garbo introduced a new masculine severity with her trouser suits, berets and restrained use of makeup. Because costume in film has to have an element of timelessness, given the time lapse between shooting and release, it soon became apparent that Parisian couture dated too quickly. Those couturiers who had been commissioned to design clothes for Hollywood were replaced by inhouse specialists, such as Adrian at Metro-Goldwyn-Meyer and Edith Head at Paramount. 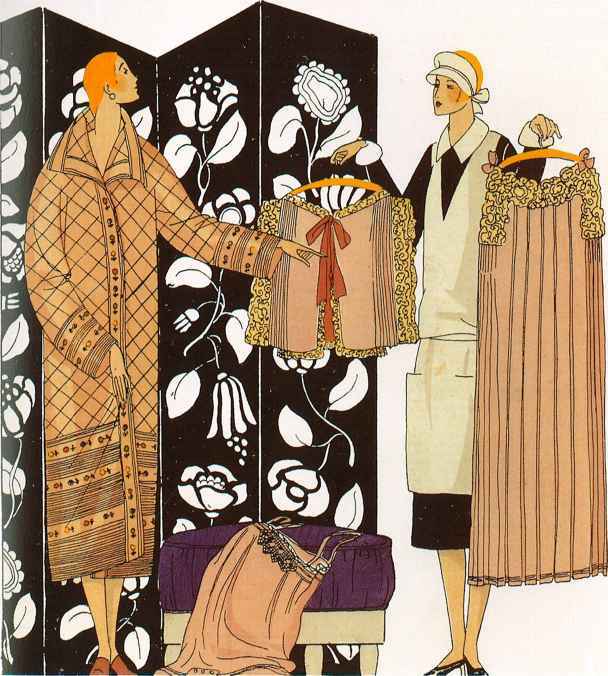 British couture was also establishing itself as a significant force in the interwar years. Norman Hartnell was appointed dressmaker to the British royal family in 1938 and his designs for Queen Elizabeth, later the Queen Mother, embodied the timeless, romantic styles that came to typify royal fashion throughout most of the twentieth century. Other well-known London designers whose work represented 'the English style', based on classic tailoring and romantic gowns, included Victor Stiebel, Edward Molyneux, Digby Morton and Hardy Amies. Middle-class women relied on skilful dressmakers to interpret the latest couture designs at more affordable prices, while the patterns published by magazines such as Vogue, Woman's Journal and Weldon's were invaluable for the home dressmaker. With the outbreak of the Second World War, these skills assumed a new importance, as women struggled to maintain some level of fashionability in the face of severe shortages and restrictions. Eric, New Look model by Christian Dior, British Vogue, November 1947. 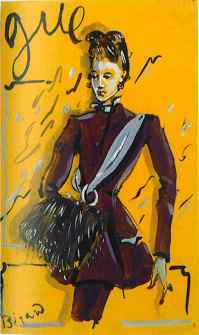 Courtesy The Conde Nast Publications Ltd.
Eric emphasizes the cinched-in waist and padded hips of Dior's coat, worn over a knife-pleated dress. in until 1941. In an effort to stabilize prices and equalize availability, coupons were issued for most items of clothing apart from headwear. Fashion hoLises began to offer remodelling services and those not in uniform were exhorted by the Government to 'make do and mend'. The Utility Clothing Scheme soon followed, involving a range of well-designed, practical and economical clothes and household goods that could be incorporated into the coupon system. In 1942 the first of a series of Civilian Clothing (Restriction) Orders severely curtailed the amount of material used in garments: trimmings, multiple pleats and pockets were limited, as were trouser turn-ups in menswear; surface decoration was forbidden; and there was to be no wasteful cutting of fabric on seam allowances, belts, collars and cuffs. British designers were recruited to demonstrate that Utility clothing need not be unfashionable - within the limitations of the scheme they created smart, neatly tailored, knee-length garments with a narrow silhouette that emphasized wide shoulders and a trim waist, with military detailing such as breast pockets. In Paris, occupied by the Nazis in June 1940, the couture industry found itself under threat. It was due only to the untiring efforts of Lucien Lelong, the President of the Chambre Syndicale de la Haute Couture, that it survived, though with drastically reduced numbers of houses and skilled hands. The shortages were, if anything, even more severe than those in Britain: fabrics were in extremely short supply and leather virtually unobtainable. Though some couturiers went abroad and some to Vichy France (Chanel retired to the Ritz Hotel, Schiaparelli lectured in the United States), other, younger designers began or continued their careers during the war years, and Jacques Fath, Cristobal Balenciaga, Pierre Balmain and Christian Dior would all contribute towards the successful re-establishment of Parisian couture in the fifties. - the privations of rationing. It was in many ways a retrograde style, harking back to the past rather than addressing the future, yet it also symbolized a return to more cheerful, optimistic times. Benito, 'Princess Lointaine', from a brochure advertising the Maison Fourrures Max, c.1925. Courtesy The Stapleton Collection. Benito's ultramodern illustrations conjure the exotic appeal of all things Eastern. The brochure, entitled 'Dernière Lettre Persane', consisted of 12 plates in 'the Persian taste'. Benito, 'Scheherazade', from a brochure advertising the Maison Fourrures Max, c.1925. Courtesy The Stapleton Collection. Furs were extremely popular in the interwar years, especially for eveningwear. Ermine and leopard are depicted by Benito in a flat, stylized manner that utilizes their graphic, rather than tactile, qualities. George Barbier, 'Winter: Lovers in the Snow', Twentieth Century France, 1925. Colour lithograph. Courtesy The Stapleton Collection. Barbier, who had worked for the Gazette du bon ton from the beginning, also designee for the theatre and for film, including Rudolph Valentino's costumes for Monsieur Beaucaire. So-called jazz jumpers and Fair Isle sweaters were popular for skiing. 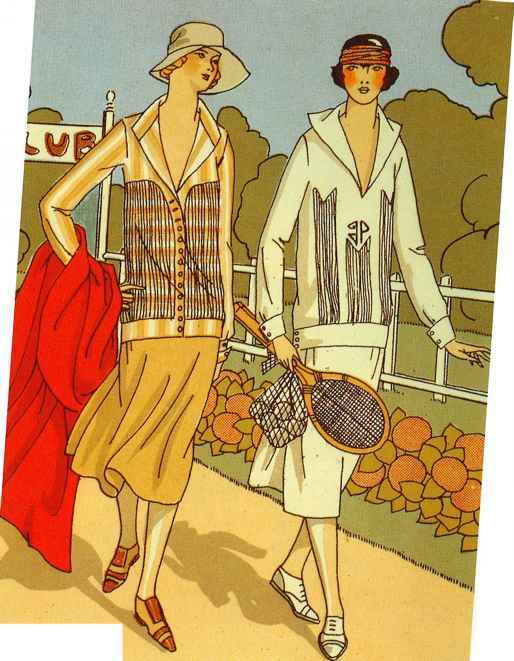 Anonymous, Informal sports clothes by Patou and Lelong, Art, goût, beauté, February 1926. Courtesy The Stapleton Collection. Co-ordinated separates by two of the Paris designers who specialized in sports and holiday wear. 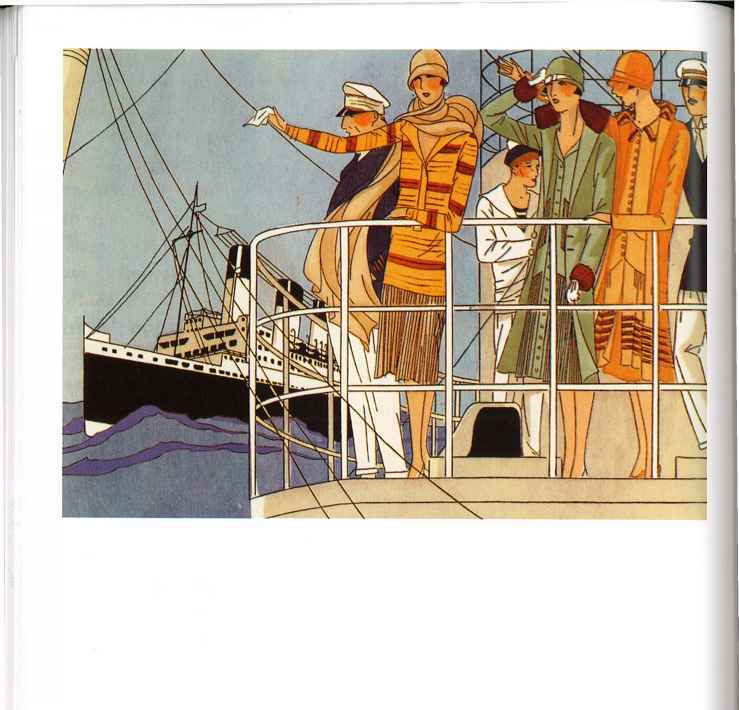 Cruising on the spectacular ocean liners launched between the wars, such as the Ile de France and the Normandie, became a fashionable pastime for the wealthy. Anonymous, 'Supercrêpe' underwear by Martial et Armand, Art, goût, beauté, October 1926. Courtesy The Stapleton Collection. Lingerie made from silk, crêpe de Chine, satin and lace was available in a variety of pastel shades. Less costly underwear was made in the new manmade fibres such as rayon. Eric Fraser, Advertisement for Weldon's women's journals, July 1926. Colour lithograph. Courtesy V&A Images. 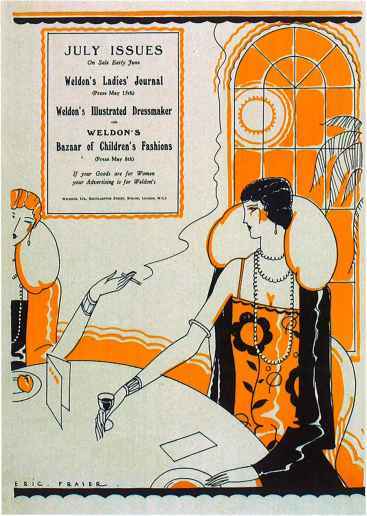 Weldon's Ladies'Journal, from its launch in 1875 until its closure in 1963, supplied the blueprint for the 'home weeklies' that saturated the market during the first half of the 20th century. Anonymous (right), Advertisement for Harrods. Frontispiece of Fashion Drawing and Design by Luie M. Chadwick, 1926. CSM Archive. A 'practical manual for art students and others', Chadwick's book includes a short history of fashion illustration, technical advice, explanations of printing and colour separation processes, and hints on getting work and meeting briefs. Fashion illustration, at its height during this period, was considered to be a suitable career for young women. Rock your personality in a dress you made yourself that reflects who you are, not what a department store thinks you want. 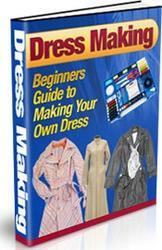 Discover The Beginners Guide to Making Your Own Dress. You do not have to wear off the rack dresses any longer. You can make your own fashion statement on the world. Who is schiaparelli designer benito artist?